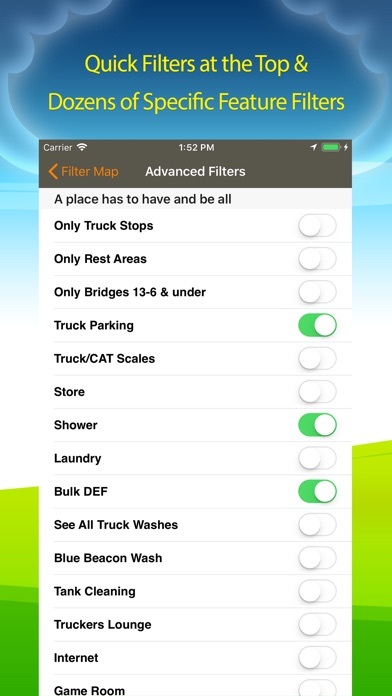 The longest running updated app for truck drivers does data like no one else so you can relax. Need a stop for the night with showers, laundry, TripPak, Subway and bulk DEF? This is the only app that can show exactly that to you and without service. The #1 and most complete resource for truck drivers has everything you need for a easier job. "Hands down the greatest truck driver resource available now. Seems like they thought of everything but it keeps getting better every month." 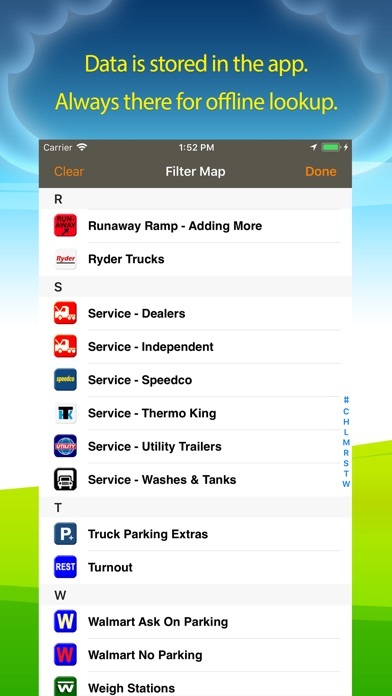 -Truck Resources "Top mobile app for truckers: An all-in-one GPS-based transportation app...A highly-customizable search and filter option lets you find almost anything ahead of time." -CDL Life As seen in "Harvard Business Review" "I paid hundreds for another device and this app does a lot more and is more accurate to boot." -Dave Nelson The ultimate app for truck drivers. 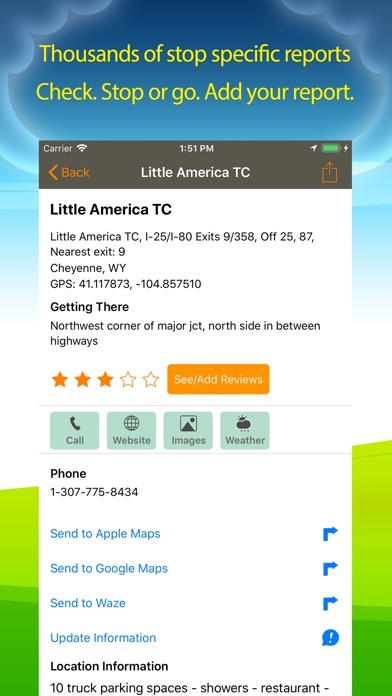 100% Made in the USA, this is the only ad free, tablet ready truck stop app that is updated with driver reviews. Where are the nearest truck stops like Flying Js? Who has bulk DEF? What food options are there? Where is the next semi dealer or tank cleaning? Need a northbound Rest area? Tunnels, Runaway truck ramps and steep inclines? 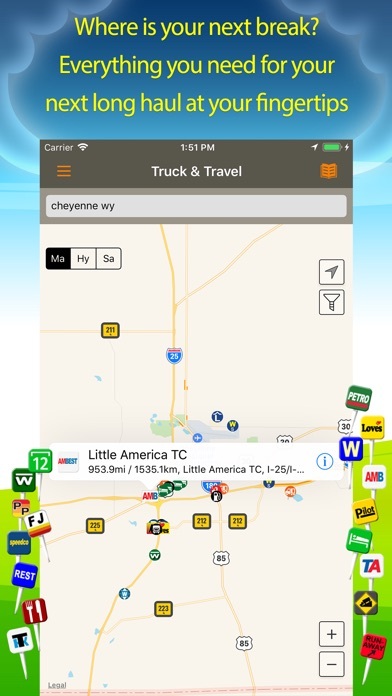 Providing online website truck stop information since 2003, this universal iOS trucker app is updated often with user input from both the app, websites and other brand partnerships. This app checks your location and displays all points on a map view. You can filter by type to see only what you want to see on the map and zoom out. You can also use the offline manual lookup anytime to find locations by type, state and city. Offline maps. Just scan your route ahead of time to load maps into memory. They will be there when service is not. This app puts all kinds of data at your fingertips. This is currently over 35,000 points. 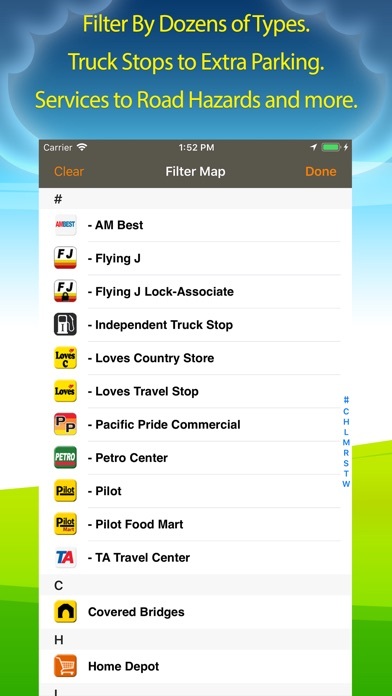 WHAT'S IN IT: Flying J Travel Plazas Loves Travel Stops TA Travel Center Pilot Petro Stopping Centers AM Best Pacific Pride Commercial Petro-Canada Sapp Brothers Roadys and other smaller brands Thousands of independents. Permanent Weigh stations CAT scales Bulk DEF dispensers filter Turn outs and rest areas by heading. Road Grades and Runaway truck ramps Truck washes Tank cleaning Walmart (No Parking/Ask Parking) Home Depot, Lowes Speedco, Thermo King, Utility Dealers (International, Kenworth, Mack, Peterbilt, Volvo, Western Star) TSE (Truck Stop Electrification) with Airedock, CabAire, IdleAir, and Shorepower Resources for each state on highway conditions, emergency phone numbers, access rules, restricted and hazmat routes, idling laws, rest area parking, laws for work zones, cellphones, texting, checkpoints, helmets, gun carrying and much more. Be informed and save the fines for your wallet. +3,000 chain motels that ADVERTISE truck parking. TRUCK STOP DETAILS (filters for most of these) parking spaces diesel lanes showers restaurant and food options internet laundry scales Transflo Tripak with pick up times game room DAT dump station propane Bulk DEF tire care road service service bays travel and cb stores lounge ATMs Western Union and check cashing UPS and FedEx FEATURES + GPS based NOAA weather + Driver ratings and reviews + Search for specific locations around you on a map or even satellite view. + The map automatically loads points as you scroll. + Multiple types of icons to help spot things on the map. + Advanced filters: Only want a certain brand with parking, showers, ATM, Bulk DEF, TSE and a Wendys? Filter for it! + One-touch calling for places that have a phone number listed. Call ahead on important stuff. + Turn-by-turn directions. + Provides data without internet service. + Supports a manual lookup mode Questions or requests? Email: apps@allstays.com for a fast and personal reply. I’ve had this app couple years and has always been good to find truckstops. But lately you are not updating with truckstops that have been built for up to two years. What happened to you? The updates to the software degraded the product. First making the buttons, especially the “centering check” button transparent was a bad bad update. You can not see the button in the sun light. It blends into the background. Worse at night. Second, the automatic centering feature has been eliminated making the transparent button problematic. So when driving, the flashing dot that indicates your location keeps moving off the screen. This creates a unsafe situation where you are constantly trying to center your location on the screen by trying to find the transparent “center” button. Though this product has many good features, I would not recommend this product. Best money I’ve ever spent. The bridge height info has saved me a lot of grief. Very accessible. You have removed your user's info such as..this Walmart only allows parking certain days or specific locations. These aren't reviews just addition general knowledge. They were easy to read and add too. Also now the reviews are only linking reviews found online. Another example just now 10/03/18 about 09:30, I'm stuck at a receiver in Elizabeth NJ and running low on hours. So grabbed my trusty iPad for this app and found that the Thomas Edison service plaza is just a few milesy away, but that's a problem it's closed and according to the NJ Turnpike Authority it will be until the summer of 2019. Your app would have been updated by users but now you relying on google. Trying to send an email to you directly doesn't seem to be working.. another glitch? Maybe providing a phone number would help. Since the latest update, this app has been terrible. It used to give you information and amenities at the locations as well as information on parking and other useful information. I use it everyday. Great app! You ruined a perfectly good app. Why? Put the auto zoom to location and "follow me" back to how it used to be! The "follow me" is in reference to how it used to show your position on the map, and it kept it centered so I could glance down while driving and see what stops are ahead. Now as I drive my location goes off the map. I must now take my hands off the wheel and tap the arrow key, which centers my position on the screen again. This is dangerous to remove my focus from driving and try to tap the arrow. Please restore this funtionality. I can't see those really small icons and always had it zoomed. Now when you tap the arrow, it returns the zoom level to a default setting. Again I must remove my focus from driving to re-zoom it. This is also very dangerous. Please restore this funtionality. I'm sorry but I cannot recommend this app any longer at its current configuration. Have been using truck and travel for over four years, worth every penny, thank you. This has been my go to app for the past three years and this update has given the app that needed push to make it all the better. 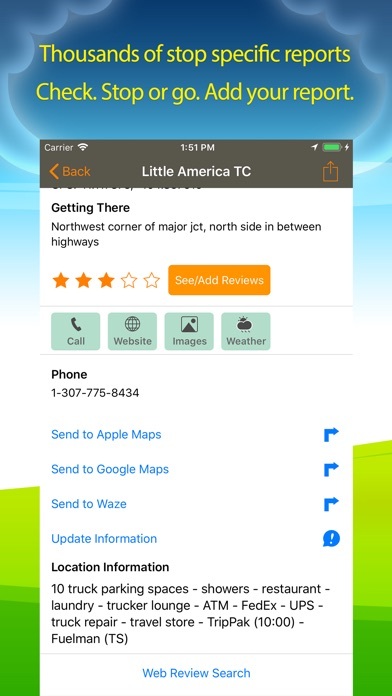 You now have the ability to quickly send your request for directions to Apple maps or Google, and the one touch copy for GPS coordinates is very much appreciated. Between this app, common sense and Google maps I can safely take my truck pretty much anywhere in the US...keep up the good work!